As the Noah that protects lust, Lulu Bell is more subdued, quiet and calm, prefers to stay in the shadows, analyzing the situation and her opponents before fighting on her own. Personality wise she is quiet and polite, while elegant and refined. She likes to play with her victims causing them to fall into her traps continuously. She's a strategist. Unlike the other Noah, who usually attacks their opponents directly, she uses masses of Akuma to aid her, though she is able to carry on fights on her own. She is also one of the Noah who shows more respect and obedience to their master, the Millennium Earl. Lulu Bell appears as a cold and beautiful young woman in her early twenties with long blonde hair tied with a purple ribbon, which has been holding a small bell. She always wears dark shades and her eyes are rarely open, and when they are, she is extremely serious. She is wearing a black suit with a blue tie and high-heeled boots. In her human form, Lulu Bell was one of the women Lavi considered beautiful. However, in her Noah form, her hair darkens to black and she removes her shades, revealing her eyes. As a Noah, Lulu has absolute command over all the Akuma, as well as destroying Innocence by simply touching it. All of her abilities, like other Noah, are based on Dark Matter. As a Noah, she is immune to the Akuma blood virus, which is normally fatal to humans. Shapeshift: Lulu Bell represents the Lust of Noah. She has the power of metamorphosis, and can change her form into anything she wishes no matter what it is (aside Innocence). This allows her to easily pass off as anybody or any form of matter. She can even become a liquid and change her body's entire structure to match whatever she wants. Her most frequently used disguise in the anime is a black cat with a single silver stigmata on its forehead. She was actually first introduced while in her cat form when the Earl was petting her. She changed into Andrew Nansen to infiltrate the Black Order, but had to steal his uniform, as it seems that she could not change her clothes along with her body. In combat, she changes her hand into a whip, and her body into water to drown her foes in. Lulu Bell was first mentioned in the battle of the black order headquarters in the manga. However, in the anime, she appears earlier to slow down the Exorcists as they try to find Cross Marian. She was the one who sent the hordes of Akuma to the Black Order. When the Akuma were defeated Lulu Bell was heading for the Akuma egg. She found the egg and opened a portal back to the Millennium Earl. The Exorcists Generals got wind of this and entered the room just as Lulu Bell was opening the portal. Lulu Bell knowing what Generals can do took Miranda Lotto hostage. She climbs on top of the egg to block all attacks heading for the egg and does an extremely good job. She finally opens the portal to the Earl and sends the egg through. The exorcists do what they can to keep the egg in the room and destroy the egg. Lulu Bell gets the egg through the portal but Allen Walker destroys the egg and rescues Miranda. Lulu Bell is flung through the portal and lands where she was supposed to meet the Earl but does not bring back the egg. Lulu was later seen in a foul mood at a dinner party the Earl hosts, crying inside her own room. When the Noah Family was gathered together, Lulu was shown amongst them, in the form of a black panther. “Meeeeeoooooowwwww…” A black cat mewed out in a silent alley way as it walked among the shadows that were caused by the buildings. Even though the feline was hidden within the shadows, a light tinkling of a bell could be heard in the general area of where the cat was. As a long strip of lightning flashed across the darkened sky much like an arc headed straight for a building, the alley way was lit up enough to show the feline sitting down under a flap of a box licking one of it’s paws. This cat was no ordinary cat even though it looked harmless. It was a member of the Noah Clan, she is known as Lulu Bell. A single silver stigmata on its forehead flashes a bit as does the cat’s golden eyes before the flash caused by the lightning disappeared just as fast as it appeared. A few minutes right after the storm has passed over, the black cat came out from under the flap of the box and started to transform into the appearance of a woman. This woman appears as a cold and beautiful young woman in her early twenties with long blonde hair tied with a purple ribbon, which has been holding a small bell. She wears dark shades and her eyes are completely closed behind the dark shades. She is wearing a black suit with a blue tie and high-heeled boots. This was the form that Lulu Bell takes on most often when she’s not in her Cat Form. 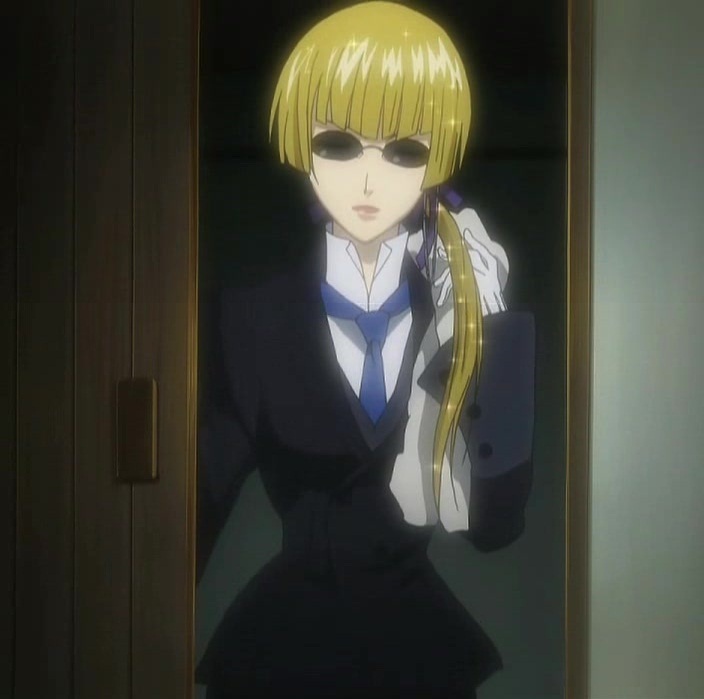 Silently, the female fixes her dark shades before she walked out of the alley way and towards a shop where she sensed a piece of Innocence hidden away within an object. She was on the hunt and she was going to retrieve that part one way or the other.